While in the middle of revamping my corporate wellness presentation on “Superfoods”, I decided to make “Coffee is a Superfood” this month’s newsletter and blog post topic. Last month I wrote about how your moldy coffee maker could be making you sick and thought this coffee topic would be the perfect follow-up. If you’ve replaced your moldy coffee maker, now you can get the full benefit of this superfood! The most interesting part of my research and why I wanted to add coffee as one of my top superfoods in my presentation is that coffee is the number one source of antioxidants in the American diet! Now, that may not be saying much considering the Standard American Diet, but if this is the case, let’s capitalize on this fact and get the most from our daily cuppa Joe! First of all, Americans love coffee. Just look at the explosion of places like Starbucks, the Coffee Bean and all the independent coffee places over the past 20 years. Europeans have been doing it for a lot longer than we have. People love to pop in one of these places for a midday latte or other type of coffee treat. Going out for coffee is up there with going out for a cocktail. Going out for coffee is a relaxing activity that may involve socializing with friends, listening to music or getting some work done. So, what’s in coffee that makes it so great? Well, think about from where coffee originates. A coffee bean comes from the fruit – the red coffee cherries – of a coffee tree. Plants that produce edible leaves and/or fruit contain varying levels of antioxidants. Different colored fruits and vegetables possess different types of polyphenols (plant chemicals/antioxidants) that support various tissues and functions in the body. The coffee bean is full of antioxidants in addition to magnesium and chromium, minerals that support many cell functions including blood sugar control. Without getting too techy and boring you all, I’ll share what seems to be the benefits of drinking coffee. 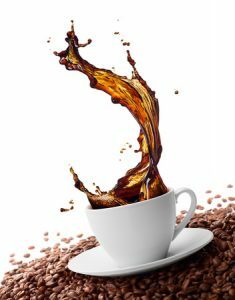 While cause and effect have not been definitively established, coffee drinkers seem to have lower incidences of type 2 diabetes, Parkinson’s disease, dementia, certain types of cancers (liver cancer for one), heart rhythm problems and fewer strokes! Coffee seems to also improve memory and mood. The downside of too much coffee may be increased anxiety, sleeplessness, and heartburn. Pregnant women are warned to not to exceed 12 ounces of caffeinated coffee per day. The good news is that decaffeinated coffee seems to provide the same antioxidant benefits. Here’s how to get the most out of your coffee: Drink organic, please! Non-organic coffee is heavily sprayed with pesticides and these pesticides do not wash off. Never drink hot coffee from a Styrofoam cup. The hot coffee will leach dangerous chemicals from the cup into your coffee. Do not reheat your coffee in the microwave. This essentially kills all the beneficial antioxidants that were in the coffee in the first place. Don’t think your giant hot or cold coffee drink is providing you antioxidant benefits; All these additional unhealthy ingredients like flavored syrups, GMO dairy and artificial colorings, are adding the wrong types of fats, sugars, and processed food additives which counteract most of the antioxidant benefits of the coffee. Don’t use coffee to artificially prop up your energy levels. This will overwork your adrenal glands. You are just robbing Peter to pay Paul. Work with a health coach, like me, or knowledgeable health care practitioner to help you improve energy and learn how to use coffee as part of a healthy diet. If you rely on coffee for your daily energy needs this is not a good thing. Another potential problem with coffee is mold levels. Many people who think they are sensitive to caffeine are actually sensitive to mold. Mold often develops on coffee during its processing. Different countries have different standards of the allowable levels of mold in the coffee that will be imported into that country. The USA has very low standards! Some people can drink coffee in places in Europe without jitters and stomach issues, but have problems when they drink coffee here. All Bulletproof brand coffee is tested for mold and is considered mold free. To order Bulletproof coffee, click here. The best way to brew your mold-free organic coffee is with a French press, pour over with a fine mesh reusable filter, or espresso maker with stainless steel parts. Okay, now go enjoy that 2nd and possibly 3rd or 4th cup of coffee knowing that you may be reaping benefits from this antioxidant powerhouse! PreviousPrevious post:Zucchini Ribbons with Pesto (Vegan)NextNext post:Is Your Coffee Maker Making You Sick?